As recorded in the July 23, 1891, Anacortes American, the Anacortes Yacht Club was “instituted Saturday evening July 14, 1891 at the room of Mr. R. Barnes on P Avenue. That evening J.P. Nelson became the first elected Commodore." On August 21, 1892, the Club became a charter member of the Northwestern International Yachting Association (NIYA) formed during an annual regatta hosted by the Fairhaven Yacht Club. 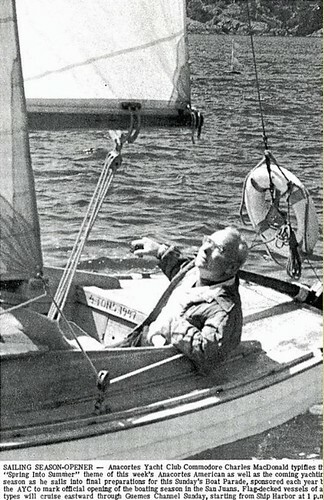 Amos Bowman, the founder of Anacortes, was a member of the Yacht Club’s House Committee and generously offered the use of an acre of land on Hat Island and a house in town for Yacht Club purposes. When Anacortes was not chosen as a railroad terminus, the city experienced an economic slump. Then, according to the September, 1909 edition of the Pacific Motor Boat, “After a lapse of seventeen years the Anacortes Yacht Club has been rejuvenated." After WWII (1949), the Anacortes Yacht Club managed to find a meeting room in the Cap Sante Boat Haven and for a few years had an annual October banquet and race in Bellingham with the Bellingham Yacht Club. AYC sponsored the Anacortes Outboard Association, held dinghy races, and the fleet would pass in review each year in the Anacortes Marineers Pageant. The 1950’s featured club efforts to upgrade the old Morrison Mill building which was floated over to the clubhouse location near the current Cap Sante Marina Office. As both the club and community grew in the 1960s-70s, so too did the cruising and racing programs. Cruising the San Juan and Gulf Islands has always been an AYC tradition, with the club making annual voyages throughout the San Juans including Sucia and beyond to the Gulf Islands. The cruising program varies each year but always features a fleet of sail and power boats and an array of activities at each destination. In 1979, the Anacortes Yacht Club was incorporated as a non-profit organization. It has helped support Interclub, and helped raise money to buy land on Fossil Bay, Sucia Island, which was then donated to the Washington State Parks Department. One of the great high points for the Anacortes Yacht Club occurred in July 1991, when the AYC celebrated its 100th anniversary by moving into new accommodations at the north basin of Cap Santé Boat Haven. In 1992, AYC purchased adjacent property that had been vacated by the City of Anacortes. In the mid-90s, the interior of the downstairs room, known as the ‘Multi-purpose Room’, was completed. Various re-models of the upstairs level of the Clubhouse have improved the restrooms, closets, storage space and bar location. In the mid 2000s, Core Builders of New Zealand, set up shop in town and built, for the BMW ORACLE TEAM, a high-tech carbon fiber monohull that raced in the 32nd America’s Cup Campaign. The club proudly displays one of the 8-foot rudders built for the trimaran that was gifted to the Club. In 2010, in recognition of the close ties the town had developed with the Core builders team, the Cup was brought to Anacortes and put on display for a public viewing. Members of the Club continue their association with the America’s Cup and have visited America’s Cup racing venues, enjoying special privileges because of the shared connection. In the summer of 2011 the Club celebrated its 120th birthday with a potluck picnic. Over 150 members, past Commodores and friends were in attendance. It became obvious that, due to our success, we were outgrowing our present facilities and efforts were begun to design a Clubhouse extension. During 2013 the club added another 700 square feet to the upper floor and additional storage below. In the past decade, AYC has hosted several National Championships including the Lido 14 National Sailing Championships in July 2012, the Baker Cup Youth Nationals in 2016 and the SC27 nationals in 2017. These highly successful regattas showcased the ability of the Club, and its members, to provide great sailing, hospitality and first class sailing opportunities to visiting yachtsmen and women from all corners of the United States. Throughout 2016, AYC celebrated its 125th anniversary with a full program of social, cruising and racing events, culminating in an epic celebration including the City Mayor and other invited guests. Continuing into 2017 & 2018, AYC continued to contribute to the community by supporting youth sailing in partnership with Anacortes High School and the City Parks & Rec., by being a lead organization in Opening Day and by giving free boat rides to over 500 people during the annual Waterfront Festival. Much more history can be found at the Anacortes Maritime Museum, on their website, and on our website AnacortesYachtClub.org. Look for the Pdf of History slides and pictures that were prepared for the 125th anniversary events. Acknowledgements go to Spencer Swain, Wendy Grey and John Wilkinson for ongoing documentation of our past accomplishments. AYC is noted for being a friendly and affordable yacht club offering full programs of Cruising, Racing and Social events in the stunning setting of Fidalgo Bay and the San Juan Islands. We look forward to a bright future as a community of those who love being on the water. Late 1940’s/1950s-AYC had 53 members, and a meeting room in the Cap Sante Boat Haven. July 1991-celebrated our 100th anniversary by moving into the new clubhouse at Cap Sante. 1990’s/2000’s-growing membership; bond with BMW-Oracle Team (33rd American’s Cup). 2012- Host Lido 14 National Sailing Championships in July. 2013- Major expansion of the clubhouse is finished doubling seating capacity. 2016- Baker Cup Youth Nationals and AYC’s 125th Anniversary Celebration. 2017- Youth Districts and SC27 Nationals. Free Boat Rides at Waterfront Festival to over 500.